For some time I’ve been meaning to devote a posting to North Carolina, an incredibly diverse state in many, many ways. Below shortly, I will do so, having mentioned the state thrice recently in reference to my search for the meaning of the term “pressing clubs,” in a passing mention of my annual visits there to Carol’s family reunions, and in a Wild Words exploration of the state’s “Tar Heel” nickname. And there’s an overriding reason to bite into North Carolina – a metaphor that will become clear late in this post. First, though, I can’t resist mentioning what seems like a brilliant little piece of economic theory and mischief, rolled into one. This looks like something an economist would cook up. Why do I get the feeling that I’d find myself falling into the “1%” slice, whatever it stands for? As you may well have heard, President Obama, Treasury Secretary Timothy Geithner, Federal Reserve Chairman Ben Bernanke, countless members of Congress, a screaming horde of TV pundits, and just about anybody else over 10 who draws a breath in the United States have come up with a prescription for fixing the struggling U.S. economy. None matches the other, of course, since economics falls somewhere mysticism and humbug. All the new theories have produced a wave of glazed looks across the land. But thanks to the St. Petersburg Times in Florida, clarity may be at hand. “How Would You Fix the Economy?” the paper asked recently, and a reader, David Otterson in Largo, Florida, sent in a suggestion that’s staggering in its simplicity. Step 1. 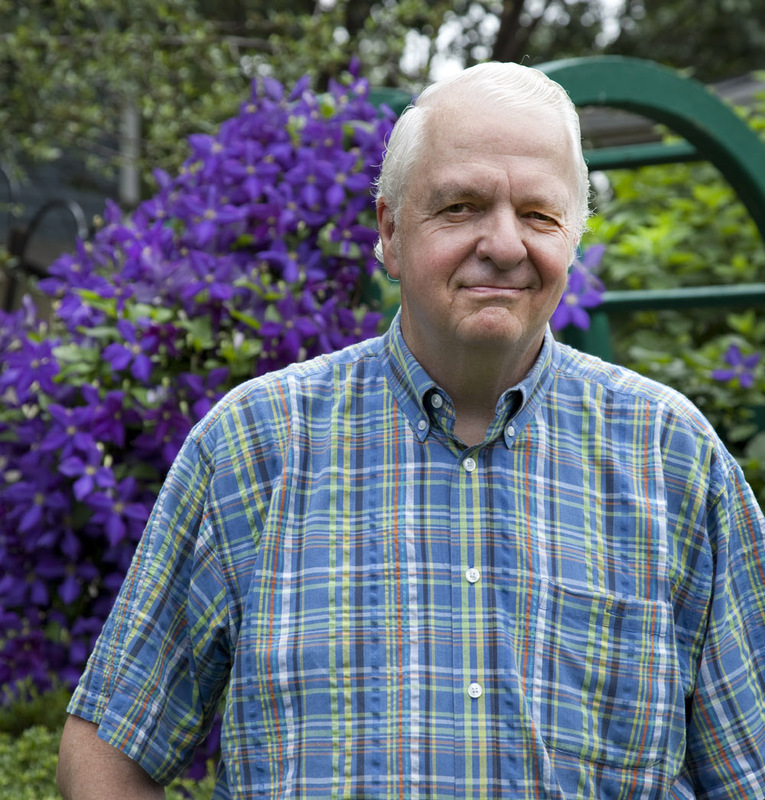 There are about 40 million U.S. workers aged 50 and over. Instead of giving multi-bazillions of dollars to the same folks who wrecked the economy, give each of these older workers $1 million! That’s $4 trillion total – admittedly an awful lot of money. President Obama won’t put a total estimated figure on all of the various stimulus packages, rescue plans, loans, and purchases of “toxic assets” left over from the splurge of lending and spending, but others put it in that $4 trillion ballpark or beyond. So Dave is working with about the right wad of cash. Step 2. 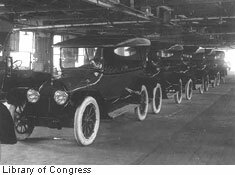 Insist that each of the 40 million recipients spend part of the million bucks on a brand-new Ford, Chrysler, or General Motors car or truck. Presto. 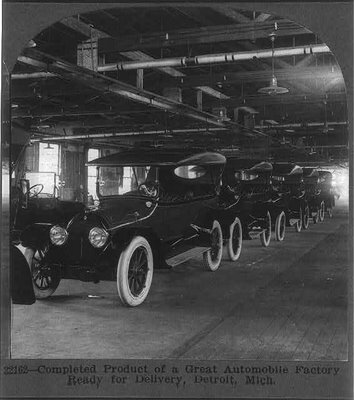 The U.S. auto industry springs back to life, and used cars traded in for the new ones are available to others cheaply as well. Step 3. Require each of the lucky older workers getting the cash to either pay off his or her mortgage or buy a new house. That would put all kinds of money into the hands of developers, homebuilders, banks and other mortgage lenders, who can then feel free to lend to younger workers again in great numbers. Presto, no more stagnation in housing loans and home construction. Overnight, the economy would be humming again. Unless the $1-million recipients bought huge, huge mansions and fancy sports cars, each would have plenty left over to spend on consumer goods, travel, gifts to their children and charities, college tuition for the grandkids, and so forth. 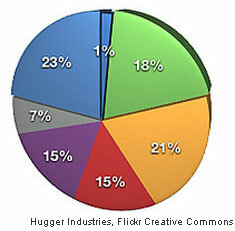 New money would gush throughout the economy. Even if the older Americans who received these windfalls put some of the money into savings, that, too, would give banks and credit unions money to lend. None of the cash in Dave’s plan would be shoveled from the government to banks and corporate fat cats that were caught spending some of the bailout money on extravagant bonuses, trips to fancy spas, sleek jets, and payments to foreign entities. At last report, the U.S. Treasury Department still has an embarrassing number of vacancies near the top. What do you say: Dave Otterson for Deputy Secretary of the Treasury? No one ever thought to call North Carolina “Long Carolina,” but the name would certainly have fit. 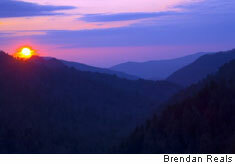 It’s 800 kilometers from its barrier islands, which elbow far out into the Atlantic Ocean, to the western tip of the state, high in the rugged Great Smoky Mountains. In fact, it stretches farther west than Detroit, Michigan, which is well into the Midwest. Until Tennessee was carved out of it in 1789, North Carolina, which is shaped a bit like the pilot’s wings that airline hostesses used to hand young passengers when airlines were still giving things away, stretched even farther westward. All the way to the Mississippi River, in fact. Once one of the South’s most backward regions, “Carolina,” as its residents love to call it, as if South Carolina below them were a yokel cousin, is now the South’s most industrial and technologically progressive state. Let me pause to explain the “North Cackalacky” title to this posting. “Cackalacky” is a slang, and lately somewhat hip, riff on “Carolina,” especially among the thousands of soldiers who endure basic training at Fort Bragg in the state’s woodsy midsection, and among glib radio deejays who just like the way “Cackalacky” clicks off the tongue. Nobody knows who first coined the term, but at least one North Carolina company that makes condiments has adopted it. North Carolina is also one of the nation’s most temperate, scenic, and historic places – America in miniature in many ways. 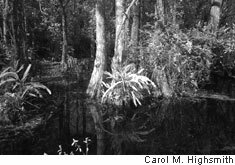 In this single state, one can visit a shoreline so fearsome that it is called the “Graveyard of the Atlantic,” mountain forests so dense that not even a county road can be found for kilometers around, and a swamp whose very name, “Dismal,” says all you need to know about it. North Carolina is also home to exquisite colonial mansions and Civil War battlefields, tobacco and cotton fields, ribbons of superhighways decorated with dazzling median wildflowers, energetic middle-sized cities, and manicured research complexes the likes of which you won’t see again till you reach California. North Carolina has grown so fast that its population shot past the traditional lions of the Old South – Georgia and Virginia – a decade ago. Almost twice as many people live in North as in South Carolina, helping to explain the smugness that North Carolinians exhibit toward their neighbors. Yet at one time, North Carolina seemed the most unlikely southern state to prosper. 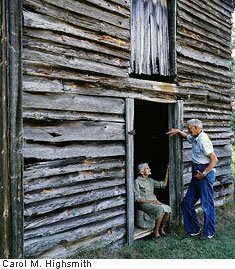 Poor but fiercely independent Scots-Irish, Germans, and English Quakers staked out small, red-dirt farms in the piedmont plateau and later the mountain valleys, promoting a sectional divide against wealthier, eastern lowland planters. In 1785 there was even an attempt to create a new, breakaway state called “Franklin” in the Carolina uplands. The insurgents wrote a constitution that forbade doctors, preachers, and lawyers from being members of the legislature. (Not a bad idea, actually.) They wanted yeoman farmers calling their tune. Their leader, John Sevier, was hunted down, arrested, and charged with treason. During his trial in the mountain town of Jonesborough – now part of Tennessee – Sevier escaped, and nobody bothered to pursue him. When Tennessee became a state, Sevier was elected its first governor! Cantankerous cusses, these mountain men and women, as I said. 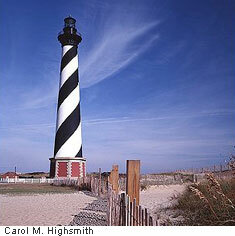 North Carolina was first visited by Europeans in 1524, when a Florentine explorer in the employ of France paused along its Outer Banks but kept going. Two years later Spaniards, sailing northward from Santo Domingo, claimed the territory for Spain but moved on as well. Spanish maps included both modern-day Carolinas in “Spanish Florida,” though few Spaniards settled anywhere near. 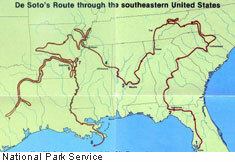 In 1540 the adventurous Spanish explorer Hernando de Soto tramped all through the mid-South on his way to discovering the Mississippi River, but he never so much as peeked eastward over the Carolina mountains. So the mid-Atlantic fell to the British to colonize. 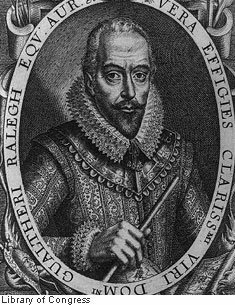 Walter Raleigh, a wealthy London businessman and courtier to Queen Elizabeth I, financed and led an expedition to find settlement sites. Raleigh became famous in the United States, but not because of his brief visit here. Sir Walter Raleigh, the brand name of one of the nation’s most popular pipe tobaccos, became a running joke when people asked for it at the store: “Do you have Sir Walter Raleigh in a can?” they would ask. What a knee-slapper! Raleigh and his crew got as far as Roanoke Island off the Outer Banks, found the native Indians to be hospitable, and sailed for home, bringing with them two “lustie men, the Indians Manteo and Wanchese,” and glowing descriptions of a “sweete, fruitfull and wholesome” land. Queen Elizabeth knighted Raleigh, who smartly christened the new territory “Virginia” in honor of the Virgin Queen. I know, we’re talking about North Carolina, but bear with me. North Carolina began as the wilds of a great big Virginia. Soon afterward the first colonists – 108 men – arrived and found the Indians not so hospitable after all. They abandoned the place and sailed for home. A second band of settlers vanished without a trace, save for the word “Croatoan” carved on one tree and the letters “C-R-O” scratched into another. The Croatoans were one of the inhospitable tribes. Exactly what happened to the “lost colony” – a hurricane? a Croatoan massacre? a deadly epidemic? – has never been determined. Virginia’s first permanent settlement would follow far to the north in Jamestown, from which colonization proceeded westward rather than southward. What is now North Carolina was not revisited by whites for more than 25 years. When it was, Charles I was king of England, and its new settlers, carrying his charter, christened it “Carolana,” the land of Charles. Remember that I mentioned how far west North Carolina once extended – clear to the Mississippi in the nation’s heartland? Well, that charter from Charles I gave its owners title to lands even farther – not just to the Rocky Mountains or California’s Pacific Coast, but all the way to “the South Seas.” Geographical understanding had a ways to go in those days. I’ll mercifully condense Carolina history from that point: Another British king, George II, purchased most of the land in southern Carolina and turned it into another royal colony: South Carolina. Both Carolinas joined the revolution against the king’s rule and became two of the original U.S. states. North Carolina was twice stripped of many of its heartiest men – first in the nation’s great westward expansion, then in the unsuccessful Civil War rebellion against the Union in the 1860s. At about that time, North Carolina was mocked as the “Rip Van Winkle of the States.” It had no large port, one cotton mill, and only a handful of iron works, gristmills, and distilleries. 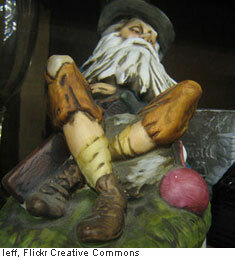 Rip Van Winkle was a character in a Washington Irving story about a man who sleeps for 20 years, during which time, naturally, all sorts of things happened around him. North Carolina was a bit like that between its colonization and the 20th Century. Just to reiterate from that previous Wild Words entry, North Carolina’s nickname – the Tar Heel State – grew out of its backwoods image, since shoeless hill folk boiling sap into pitch and turpentine were known to amble home with tar on their heels. Already poor, North Carolina after the Civil War struggled to assimilate more than 350,000 freed slaves, who had been the working backbone of its economy. But the 20th Century brought amazing transformations: the emergence of several collegiate academic powerhouses, including the University of North Carolina (UNC) at Chapel Hill and Trinity College (later called Duke University) in Durham; vast military training facilities that would be jammed with recruits in both world wars; the creation of a sprawling Research Triangle Park through the combined efforts of UNC, Duke, and North Carolina State universities; development of a renowned furniture industry in the “Piedmont Triad” of towns like Winston-Salem and High Point; and a surprising explosion of culture in “the coolest spot in the South” – the Carolina mountains around Asheville. Once a resort and rehabilitation town frequented by thousands of “summer people,” Asheville would eventually sport a thriving artists’ colony, imaginative Art Deco architecture, and George Washington Vanderbilt’s Biltmore estate. 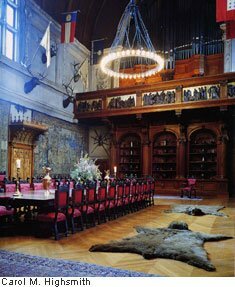 The last was so magnificent that each year, its minions would concentrate on the lavish furnishing of just one feature: 16th Century Flemish tapestries one year, for instance, hand-carved wood ceilings the next. Off to the east, so explosive was the growth of banking that bustling Charlotte now ranks behind only New York as a financial center. Of course, it may not be promoting that fact right this moment. 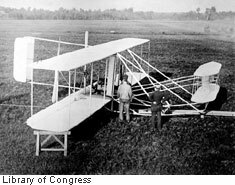 There’s lots more that’s remarkable about North Carolina: 200-year-old historic districts in cities like Wilmington on the coast; championship golf courses; a memorial at Kill Devil Hills to the Wright Brothers’ launching of history’s first powered flight on December 17, 1903; and that Dismal Swamp’s “vast body of dirt and nastiness,” as the head of its first surveying party described it. Little wonder: his men were nearly devoured by the yellow flies, chiggers, mosquitoes, and ticks whose descendants still rule in that area. I’ve left out one great milestone: the 1937 founding in a little Winston-Salem storefront of Krispy Kreme doughnuts! These delicacies, often served hot right out of the fryers, became a southern institution and spread like wildfire around the world. In 2000, the company took its stock public, and people rushed to buy the initial offering at $21 a share. 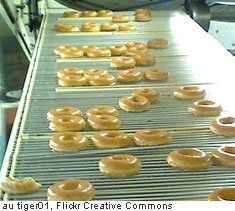 By 2004, the price had more than doubled, Krispy Kreme was reporting almost $100 million in annual profit, and the number of its shops had tripled to 400, as far away as South Korea. The company would take a severe hit when a “low-carb” [carbohydrate] diet craze swept the land, but “sliders” – hot, airy Krispy Kreme “donuts” that fairly melt in the mouth enroute to joining seven or eight others in the stomach – remain an indulgence for which I, for one, will long thank North Carolina. In The Book of America, Neal R. Peirce and Jerry Hagstrom called North Carolina “the newest megastate.” That was in 1983, well before many of the business and cultural explosions that I have described had fully taken hold. Often overshadowed by courtly Virginia, enterprising Georgia, electrifying Florida, and eccentric Lousiana – and lacking a single magnet city until Charlotte got its big banks and a National Football League team – North Carolina snuck up on the nation’s consciousness. A megastate it now is, but North Carolina has never let loose of its down-home culture, character, and cuisine. Which brings me to a delicious final exploration – and I’m not still talking doughnut sliders. If you’ve hung with me this far, you’ll recall my early metaphor about “taking a bite” out of this intriguing state. Now all can be revealed: the bite is from a scrumptious North Carolina barbecue sandwich. This is “peasant food” at its very best. It’s not hoity-toity luxury fare served at swanky clubs, but a delicacy straight from the hills. I can almost smell and see the smoke a-risin’ from a clapboard smokehouse as I write. I won’t say that this is as fancy as a North Carolina barbecue joint gets, but they don’t get much fancier! Notice that I carefully specify “North Carolina” barbecue, since outposts like Memphis, Tennessee; Kansas City, Missouri; and mesquite-filled ranches of West Texas also claim barbecue superiority. There’s even something called “California barbecue” that’s liable to be slathered in exotica like Chinese hoisin sauce and lime. I’ll probably deny writing this when I post about these places, but their barbecue doesn’t hold a plastic fork to the stuff that slow-cooks in Carolina smokehouses and is served out of some of the plainest shacks in the land. So plain that the only place to sit is outside on a crude wooden picnic bench, if you’re lucky. Doesn’t matter. Every splinter’s worth it. True North Carolina barbecue is made of pork, rarely beef. Pigs fare better in the hills than cows – at least until butchering day. The Reeds and McKinney tell us there are still more hogs than people in North Carolina today. That’s a lot of curly tails, since there are more than 9 million North Cackalackians. 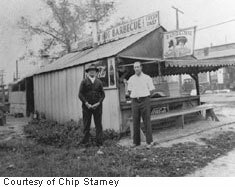 I wouldn’t say that North Carolina barbecue pitmasters wouldn’t let a catsup bottle on their property, but “ketchup,” as it’s sometimes spelled, is not as prominent there as in other varieties out west. Their speciality begins, unfortunately for the pig, with one that has been slaughtered, skinned, and gutted. Then it’s sloooowly turned over a low, open pit of hot hardwood coals and slathered, several times, with tart, vinegary marinade. The aromatic final product is then sliced or diced into little, forkable strands. 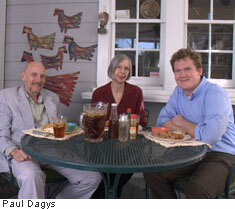 The Reeds and William McKinney stuff their book with photos of humble “bar•b•cue” dives, explain how “barbecue” became an occasion as well as a dish, and set our mouths to watering with recipes – not only for barbecued meat but also for the Carolina sweet tea, slaw, and hushpuppies that go with it. What’s a hushpuppy? You’re one paragraph away from finding out in Wild Words. Carol is not as big as I am on, shall we say, “rural food” that hasn’t been inspected by federal agents in white coats. But she tolerates the ritual that sets in every time I cross the North Carolina line. 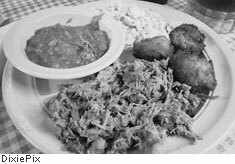 No matter the place or the price, I find me a barbecue place (“find me” being a southernism that my suspendered hosts seem to appreciate), set myself down (another one) and dig into two or three North Carolina barbecue sandwiches – heavy on the hot sauce. I’m not much on sweet tea, but I can nurse one cold beer with my barbecue and still drive safely. It’s a wonder, though, that the Cackalacky troopers don’t pull me over just to see what’s put that big smile on my face. 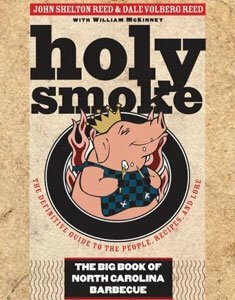 Holy Smoke: The Big Book of North Carolina Barbecue, by John Shelton Reed and Dale Volberg Reed, with William McKinney, is published by the University of North Carolina Press. One quick postscript to my recent observations on the moribund newspaper business. As media analyst Howard Kurtz pointed out in the Washington Post, it was ominously telling that, in his recent prime-time news conference, President Obama called on correspondents from the big broadcast and cable networks, plus representatives from outlets such as Ebony magazine and the relatively new Politico paper. For the first time in anyone’s memory, he did not recognize a single reporter from the top daily newspapers, including the Post, the New York Times, the Chicago Tribune, and USA Today. First go circulation and advertising revenue, then influence? Chiggers. These are tiny parasitic bugs that lurk in the woods and weeds. They attach themselves to your skin, often around exposed ankles, and feed on the fluids in your skin cells. The enzyme that they inject causes little red welts that can itch for weeks on end. Hoity-Toity. Haughty, stuck-up, much like an earlier Wild Word: highfalutin’. 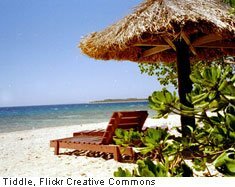 An old English verb, hoit, referred to romping around noisily – another form of showing off. Hushpuppies. These are bite-sized bits of deep-fried cornbread. They originated as scraps left over after a country chef prepared pans of cornbread. Supposedly, the family hound would whine to be tossed some of these treats, to which its mistress would scold – you guessed it – “Hush, puppy”! Windfall. Unexpected good luck, especially of the monetary sort. If your long-lost uncle leaves you a million dollars, that’s a windfall! The term may have originated in an orchard. When the wind blows a pear off the tree, you don’t have to climb up and pick it. Yeoman. As a noun, this refers to a free person who cultivates his own land. (There doesn’t appear to be a feminine “yeowoman.”) In the adjective form, yeoman work is hard, prodigious effort.